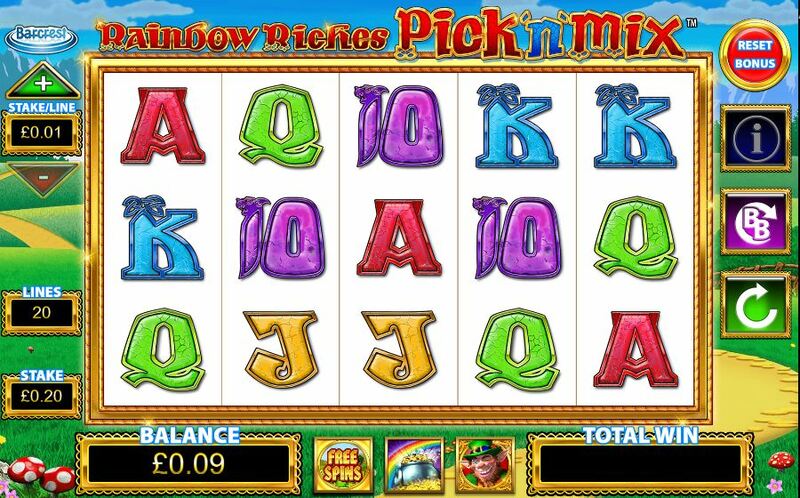 With a ton of bonus features available, Rainbow Riches Pick N Mix brings together all the best bits from its predecessor Rainbow Riches. This online slot game from Games can be played across different platforms. The Irish theme continues throughout the game, perhaps you had better go hunting for a four leaf clover before you hit the spin button. This 5 reel, 3 line game follows the footsteps of games of old, Barcrest Games have gone from creating the famous land-based slot machines to developing new and exciting online games. Rainbow Riches Pick N Mix is no expectation! There are 5 great bonus features to trigger and you can play for free or for real money if you want to. The world-renowned green leprechauns will be closely grading their pots of gold, are you up to the challenge? It’s top of the mornings all around when you hit that spin button. What’s more, you can choose one bonus feature to appear more often within the game, which one are you going to pick? Barcrest Games are ready and raring to go with this exhilarating game, who can resist green meadows and pots of gold anyway? Visit the site homepage to learn new features of Easy Slots! Founded in Greater Manchester in the United Kingdom in 1968, Barcrest Games are one of the most famous developers of slot games around. Go to any pub, bingo hall or club in the UK and you will be sure to find one of their machines. In the beginning, they mainly focused on land-based slot machines. Then after being acquired by IGT and then by Scientific Games, they went on to develop online slot games. One of their most famous is Rainbow Riches which has a couple of sequels. Many of their titles are available both on land and online across the different platforms which means you can pick and choose how you want to play. Being a part of an ever-growing business with strong links with other developers, Barcrest Games tended to focus on fruit slots which we all know and adore. Now they are moving with the times and focusing on creating mobile and tablet slot games for you to enjoy, their trail bonus rounds are sure to appear in one of two games in the future so make sure you keep an eye out for them. 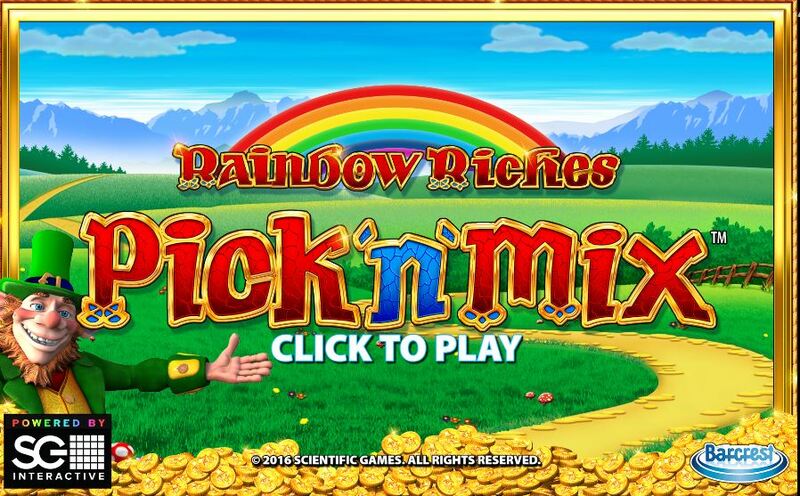 Grab all the green clothing you can find, follow the rainbow and try and find the pot of gold, Rainbow Riches Pick N Mix is here to bring you all the Irish luck you will ever need. The traditional five reel, three line format echoes games gone by. The colourful graphics and great animations which is sure to coax a smile as you hit the spin button. At the beginning of the game, you can pick 1 of 5 bonus to appear more often as you play the game, a great feature for all. This can be changed at any time during the course of the game, a great way to shake things up. And you don’t need to have played the original Rainbow Riches in order to play this game. There are a total of five bonus features in the game, the controls are easy to master as well. The Wild is a golden leprechaun. The bonus feature includes the Road to Riches Bonus, this can be triggered by getting 3 bonus symbols on the reels. If you manage to get 5 symbols, you bypass the steps completely and get the 500x reward. Another feature is the Cash Crop Bonus and can be triggered by getting 3 symbols on the reels. A 10×5 grid of 50 coins will appear, you can choose to go on and another round will begin or you can collect the coins on screen. * Magic Toadstool Bonus: this can be triggered by getting 3 or more Toadstool symbols on the screen. If you get 5 triggers, you will be instantly rewarded with 500 times your bet. A 6×4 grid of 24 toadstools with 3 picks. Picking a toadstool will give you a cash prize or Fairy who will give you a further 3 picks. * Free Spins Bonus: this feature can only be triggered by landing 3 or more Free Spin scatter symbols on reels 1, 3 and 5. If you manage to match 5 of the scatter symbols, you could get up to 30 free spins to enjoy! * Pots of Gold: this can be triggered when you land three symbols on the reels. Gold, silver and bronze pots will appear on the screen and whichever the arrow lands on will be your prize. You could win up to 500x your original bet. The brightly coloured pts are defiantly worth keeping an eye out for.